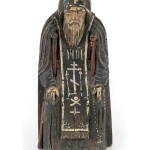 A rare collection of Eastern Orthodox icons comes to Norfolk, Virginia. 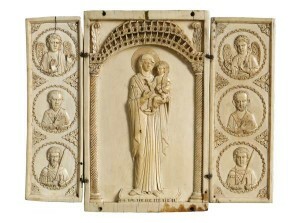 Mother of God with Saints, also known as The Werhner Triptych, Byzantine, 10th century, ivory. 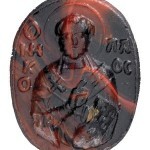 Cameo of Saint Nicholas, Italy, 11th–13th centuries, red glass. Saint John the Baptist, Constantinople, Turkey, circa 1300, egg tempera on wood. Icon painting is a living tradition. Of the 160 rare icons now on view at the Chrysler Museum of Art’s exhibition “Saints and Dragons: Icons from Byzantium to Russia” (through January 10), many examples date from the Middle Ages. However, “they go all the way up to 2014,” says the show’s curator, Seth Feman, giving viewers a comprehensive look at the iconography of the saints, Jesus Christ, and the Mother of God through the eyes of the Eastern Orthodox Church over centuries of art-making and worship. 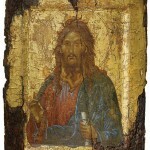 Icons, which are most typically rendered in egg tempera on wood, are thought to be “windows to heaven,” having the ability to act as a pictorial gateway for communicating with the divine. Each icon bears the spiritual energy of the saint who graces it. Closely tied to Biblical narrative, artists creating icons today must use a template of Church-approved “originating icons.” These time-tested, powerful pictures have been said to have performed miracles such as healing the sick or rescuing a city from an impending threat. The collection of icons on view at the Chrysler reveals just as much about the history of Byzantine art as it does the story of the Orthodox Church and the spread of Christianity through Russia. 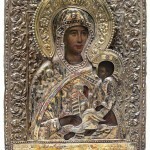 It is a collaboration between the British Museum in London and the Museum of Russian Icons in Clinton, Mass.—the show’s first and only other stop in North America. In fact, before this exhibition of 35 icons and 30 related art-historical objects (such as cast metal objects, ivories, and engraved gems), many of these exemplary pieces had never been seen outside London. Prince Charles, as it turns out, was instrumental in getting the collection on the road. “The show began, as I hear it, in a conversation between Sir Richard Temple, an icon collector, and Prince Charles about the British Museum’s collection,” explains Feman. “Prince Charles learned that a lot of icons were in storage and felt that they should be shared and sent out for conservation.” Soon after, the British Museum approached the Museum of Russian Icons. “They have an extensive collection,” says Feman, “and seemed like a logical partner.” From there, the Chrysler Museum, which Feman says has professional connections with the Museum of Russian Icons, accepted the offer to show the exhibition throughout the fall and winter. Diverging from the Museum of Russian Icons’ set-up, in which the pieces from the British Museum were shown in a separate room, the Chrysler will combine examples from both museums throughout the exhibition space. “We’re fully integrating them, with the understanding that most of our visitors will be unfamiliar with the material,” says Feman. Initially, the Chrysler wanted to organize the exhibition in a way that would trace the flow of the Orthodox belief system and iconography from its Mediterranean roots to Russia. However, thousands of objects would have been necessary to properly illustrate the journey. The Orthodox Church has its origins in the churches founded by the Apostles in the Balkans and the Middle East in the first century A.D. It gained followers throughout the Byzantine Empire (or “Eastern Roman Empire”) during Late Antiquity and the Middle Ages, simultaneously developing a highly devout artistic style, which is thought to be more symbolic than realistic when compared to the naturalism of Greco-Roman art. Two exceptional icons from the British Museum make their American museum debut in “Saints and Dragons”: Saint John the Forerunner, an icon from Constantinople, circa 1300, and Miracle of Saint George and the Dragon (often referred to as the Black Saint George) from late 14th-century Russia. Saint George—a Roman soldier who spread Christianity while traveling with the military and was subsequently tortured for it—is perhaps the most popularly depicted saint in Greek and Russian Orthodox iconography. In the Black Saint George he is seen riding a black horse, lance in hand, vanquishing a dragon underfoot. 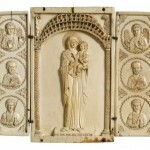 The Chrysler will be the only American institution to exhibit six ivory icons from the British Museum. These incredibly delicate pieces were unfortunately unable to be shown at the Museum of Russian Icons due to government restrictions on the import of elephant ivory. The Chrysler however, with the help of officials at the U.S. Fish and Wildlife Service, was able to secure permission to bring the ivory icons to Virginia—facilitating a rare and exquisite treat for museum-goers.